On The Precipice Of Collapse? When attempting to understand the importance of events and likely probabilities of future outcomes its critical to be open minded. As long as you are not reading boom or gloom content, there are often moments when the same concept gains a new meaning if you slightly alter your perspective. Instead of relying on dogma, the purpose of our articles is to remove misconceptions through the use of facts, good arguments and supporting charts. Our goal is to follow the facts, wherever they may lead. If your argument is better, let us know and we will adjust our framework. 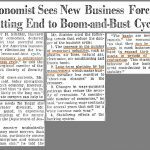 While sometimes events appear to be white or black, often the truth is in the middle, a muddied up gray, therefore rarely are their simple conclusions, or straightforward rationalizations given that the economy is a complex system. You can be accurate in your understanding of history, yet still lose money in markets. Therefore, in addition to having an accurate perspective our goal is to put it into context of timing. We have some more misconceptions to bust in this article. When you are trying to figure out when your biases might be leading you astray, the first aspect to check is if you stop listening to arguments you disagree with because of how your portfolio leans or because of your political perspective. The answers which will help bust your misconceptions are often right under your nose, but you miss them because you don’t consider how your theses can be wrong. Keep in mind that just because an argument has been proven by some historical market action, doesn’t make it a good indicator of future performance. Many of the misconceptions we tackle are ones which show this current environment is unsustainable. There are some unusual parts of the market, but many factors are manipulated by charts to make it look like the market and the economy are on the precipice of a collapse. 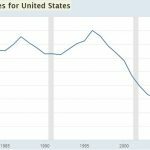 There are charts floating around the financial spheres which claim the stock market is in a massive bubble because U.S. equities’ market cap as a percentage of GDP is higher than ever before. Some call this the “Buffet indicator” to give it more gravitas. The reality is you should not trust a financial metric just because a famous investor once recommended it. There is no financial indicator which will always be successful; it’s always possible an indicator which was once recommended no longer works. In this case, the indicator is no longer mathematically sound. The recent growth of international corporate profits means that comparing the market cap of American firms, which obtain corporate profits from around the world, to domestic GDP isn’t accurate. The better comparison is looking at domestic corporate profits as percentage of GDP. As you can see from the chart below, these two metrics have diverged because of the growth of international profits. 30% of S&P 500 revenues come from international markets. The key takeaway is that the valuations this cycle have been close to what they were in the 1960s, meaning this isn’t necessarily the biggest bubble of all time by far like the red line indicates. 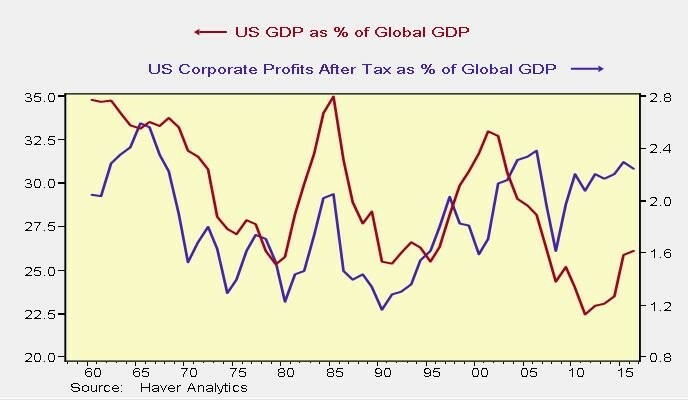 The other factoid to consider is that because of the growth in international profits, the U.S. GDP as a percentage of the global GDP has diverged from U.S. corporate profits as a percentage of global GDP. Secondly, US corporate profits as a percentage of global GDP are much more normal than American firms’ profits as percentage of U.S. GDP. U.S. corporations can go to whichever country is exhibiting the most growth. You don’t need to buy international ETFs to gain global exposure; just buy the S&P 500 index fund, which is the most liquid, as we detailed previously. If you want domestic exposure, buy the Russell 2000 index fund as small caps don’t have as much international exposure. Another myth is that the tech rally has been caused mainly by multiple expansion. Multiple expansion is when investors bid up stocks based on optimism instead of improvements in earnings. With the price appreciation of the FAANG tech stocks, some might believe this myth. Whenever inexperienced investors see large price acceleration, they tend to shy away from the stocks because they think they are more expensive. That’s a misnomer because if earnings are growing faster than the stock price, valuation can go up and while being cheaper. The pie charts below set the truth straight as 62% of the price appreciation in tech stocks from 2014 to the present was caused by earnings growth and only 38% was caused by multiple expansion. Don’t fear the 87.8% returns tech stocks have had; embrace them. The overall S&P 500, excluding tech stocks (and internet retail), returned 26.2%, but more of that came from multiple expansion. 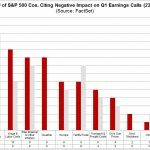 46% of the rally was caused by multiple expansion and 54% was caused by earnings growth. According to Credit Suisse, tech has a 20.6 multiple while the rest of the market has a 17.8 multiple. These figures vary depending on how you calculate earnings, but the point remains that tech isn’t overvalued. In 1999, tech had an over 20 point multiple premium to the overall market. To summarize, the tech rally in the 1990s was based on euphoria about future earnings growth which is now finally being realized 18 years later. 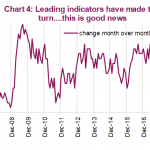 Is The Credit Cycle About To Pick Up? The next point is less of a mythbusting moment and more of a point which is food for thought. As you can see in the chart below, the high yield spread has predicted the total loan and leases growth. With the improvement in financial conditions, despite the three rate hikes by the Fed in 2017, the situation is ripe for an improvement in loan growth. 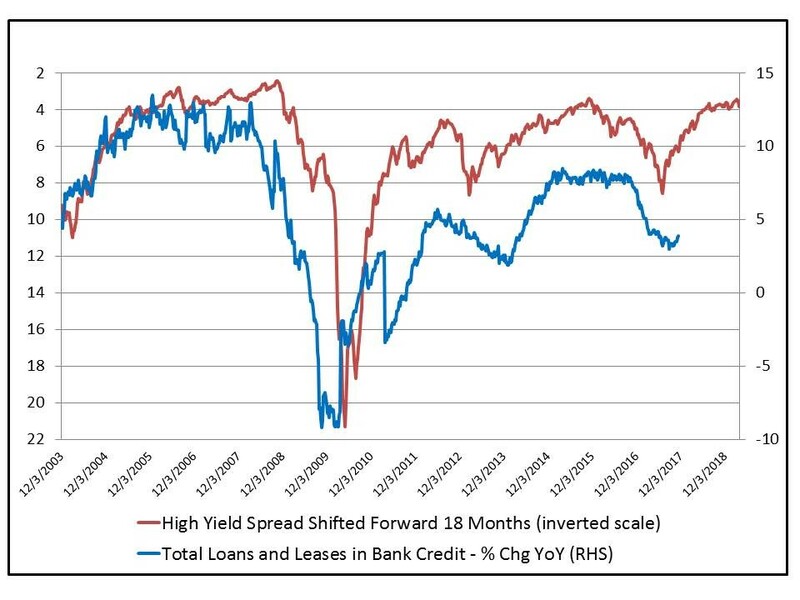 With the high yield spread reaching near the previous cycle’s lows, it’s possible that the loan and lease growth in bank credit will see the fastest growth rate of this economic expansion. Keep in mind, this doesn’t mean the overall stock market is about to soar because the junk bond market and the stock market act in tune if the sector weightings in the respective indexes are close. This does mean financial stocks might do well. Financial stocks usually do well when the Fed raises rates at the end of the business cycle as their net interest margins improve. The loan and lease growth could provide further momentum for this sector to do well in 2018. When you include the international earnings of U.S. stocks, their valuations aren’t unrealistic. The other valuation metric to keep in mind is the Shiller PE. It has barely ever been near the long term median or average in the past 20 years. You can decide to lower your equity exposure because of the high Shiller PE, but there’s no reason to expect a decline in the index in the near term. 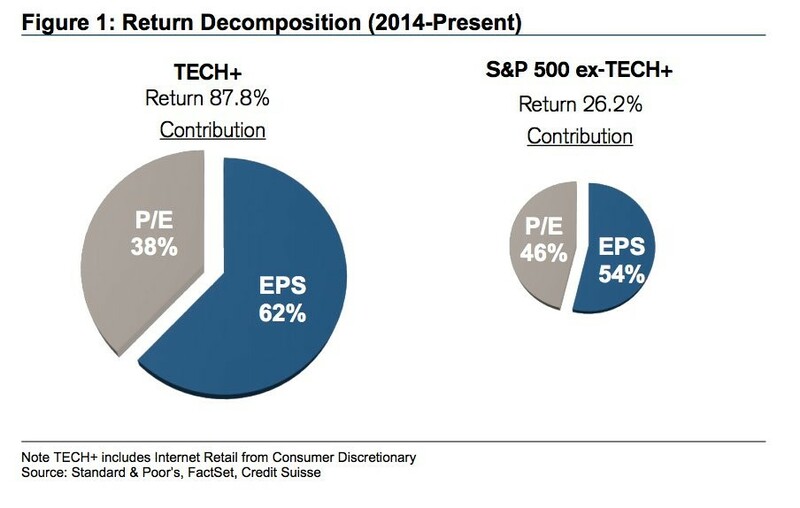 Secondly, tech stocks aren’t expensive because their earnings increases justify the price appreciation in the sector. Finally, financials might do well in 2018 because loans and leases are expected to see accelerated growth and because at this point in the cycle when the Fed is at the end of its rate hike process, financial stocks usually outperform.